The 2019 Nascar Sprint Cup season kicked off with a bang - or rather, several bangs - when the No.95 Toyota of Matt DiBenedetto was clipped by Paul Menard’s No.21 Ford with 10 laps to go. 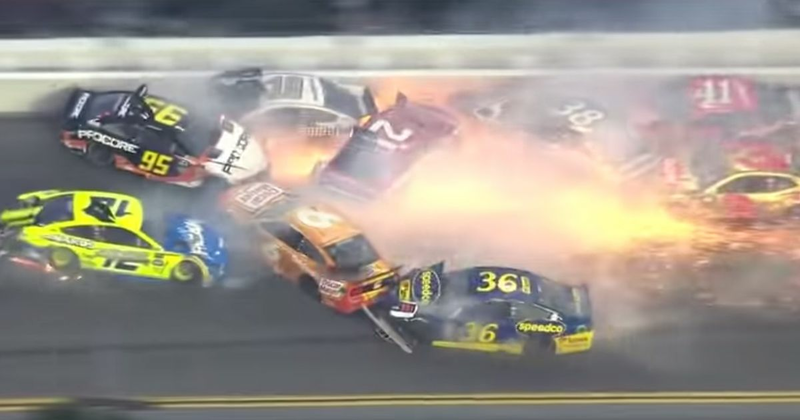 And because this is Daytona, naturally they weren’t the only two drivers in the crash - 16 other cars all became involved in the pile-up. Any accident involving that many cars is going to be spectacular but with sparks flying everywhere, this looks almost poetic - especially in slow motion. Thankfully, despite the mayhem, nobody was injured. Denny Hamlin stayed clear of the chaos won the race for a second time, seeing off Kyle Busch.